Yay it's March! I couldn't wait for March to come because I'll be playing catch-ups with a bunch of things this month. I'm most definitelygoing to catch up with my two bees I fell behind terribly andI'm planning on some serious make-over for my craft room and for my blog design. (I can't wait to show you my room filled with lovely lovely handmade gifts from friends!) Hanging out with friends and Joe and a lot ofgifts-making are happening too, not to mention I'll get to experience the springin Japan first time in 9 years. Woohoo! 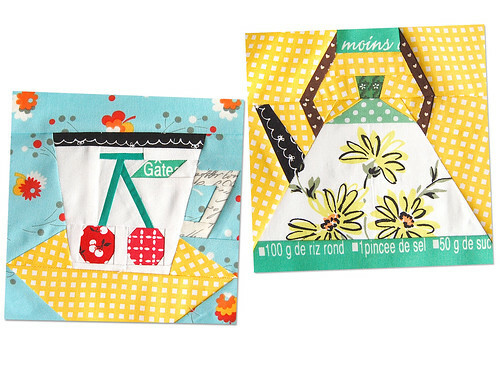 I made two blocks for Kerry for her Afternoon Tea theme for Patchwork 318 bee. I'm pretty happy with how this kettle turned out except for..
this unacceptably small seam allowance! This happens to me quite often. As the block I am working on is about to finish, I start slacking off and just eye-ball to make sure if pieces are large enough and I don't realize the lack of seamallowance until the very end. (Am I the only one who has this problem? )Knowing Kerry's amazing piecing skill, I know she wouldn't have too much troublepiecing it, but I wanted to give her another option in case this doesn't work out for her. I made this in the hope to make up for it, but I am so not happyabout this result. The addition of the black fabric was a bit too much and the tea cup turned out quite wonky. Hopefully,she doesn't mind these as much as I do. Thank you for stopping by ;) Just to warn you... I will be blogging a ton in March! Both blocks are quilt lovely! You did a great job! Both blocks are fab! 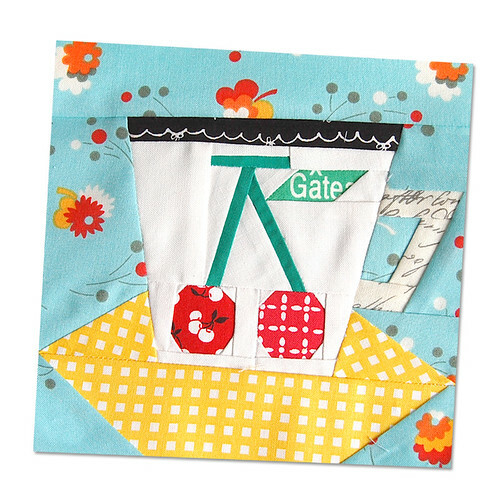 I love the fabric you chose and the cherries on the cup! How adorable!! You amaze me with your creativity!! These are soo lovely Ayumi, especially the pot! I think they're really nice!! 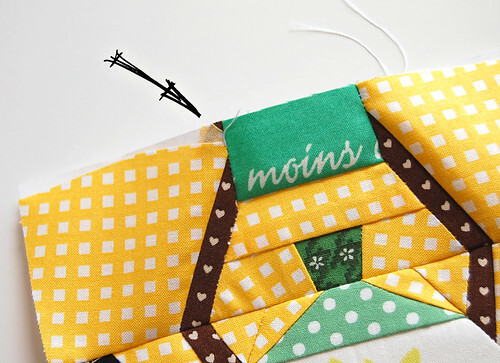 I would like to know how to make "wonky" quilt like yours!!! This is the best graphics designs on the fabrics.It look so fabulous.This type of fabrics we can give for the gift.It look amazing. Ooh you are so lucky Ayumi to be back in Japan at Springtime. I'm sure all the beautiful cherry blossom will give you inspiration for some new projects hey? I last travelled to Japan in the 1990s backpacking ... would love to have another trip someday. I think they are both adorable Ayumi!!! I especially love the teapot and the little cherries on the teacup =D I can't wait to see your craft room!!! They're both so cute! You are the master paper piecer! I, for one, am glad to see that you are actually human. HA! Apparently you can make some mistakes....I never would have believed it had I not seen this with my own eyes. They are both adorable block Ayumi! These are absolutely fantastic! 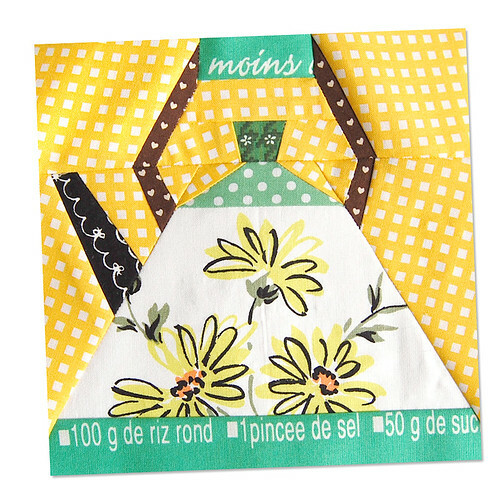 I just love the fabrics you used. You've got mad skills, woman! I dream of experiencing Spring in Japan with all the cherry blossoms around you. So enchanting! You can "mess up" on a block for me any day, Ayumi. You crack me up. I would have unpieced the seam and fixed it. You, no, you go make a whole extra block. You are amazing. These definitely make me smile :) They're wonderful!! They are both totally gorgeous!! you are much too hard on yourself! love them both and i hate when i do that too! aaaarrrggghhhh! I almost passted out when I saw the cherry cup! TOO TOO CUTE. A M A Z I N G as always!! I would be happy if I could make blocks as lovely as these, mistakes or not. They are fabulous. With spring coming will you be posting some photos of cherry blossom season. I hear it is beautiful in Japan. Your kettle is not 'less' it's more! Very cheery. And I didn't think the black was too much or notice any wonky. i think they look great ayumi! i love that you showed that seam allowance. we all do it! Have a happy spring! I love them and thanks for showing your tiny boo, boo, now I do not feel so bad. Love love love these blocks. They are so incredibly cute. Makes me want to take another paper piecing class. I'm so bad at it. My daughter is going to Tokyo in May. I don't know what area they will be in. She is going with her Business Scholars class from the University of Utah. I would love her to bring me some fabric home with her. I know A-Two isn't in Tokyo. If you could recommend a store she could go to or a couple, I would appreciate it. Sorry I don't know more about where they are going. Maybe I'm asking you too soon. But I'm very excited for her to see Japan. Blogging a ton? Bring it on! I do like the teacup and the black fabric part for sure. Your blocks are always wonderful! I love especially the cherries on the cup - sweet! Love them both. Don't change a thing!! 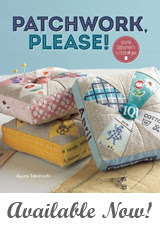 They are beautiful Ayumi - and now I am such a paper-piecing expert, I know what I am talking about! OMG!! Those blocks are super cute!! I always look forward to seeing what you come up with. I am going to have to try my hand at some more paper piecing. You are way too hard on yourself! Those are adorable! Love the tea theme. And I enjoy kerry's blog so can't wait to see what she does with all the tea blocks. I also love mushroom themes, and I'd love to see you piece one! Are you kidding?! These are adorable! I absolutely love these blocks! 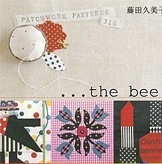 I would love to get my hands on a copy of the Patchwork 318 but I can't find a copy anywhere!!! Maybe someday one will turn up. Oh, Ayumi, you've done it again! Totally brilliant. I was so surprised that you didn't like the black on the cup 'cuz I noticed it first off and thought it was brilliant. I'm sure I'm not alone in being delighted that you're going to be back blogging a lot. You inspire us all... Bring it on! Your quilts/crafts are so fantastic! 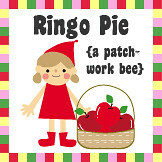 I love Japanese patchworks!! Black works fine, expecially with the teapot. I think that inexact (wonky) is often better. It won't win the quilt show but it will be more interesting visually. So darn gorgeous! Lucky Kerry... I love both these blocks..
Ayumi, these are lovely and make me want to get cracking on learning how to paper piece. Enjoy all the festivals that are coming your way with springtime in Japan! I am so happy to hear we will be "visiting" a lot this month. Wow these are sooo cute! I've never tried a picture block before, might have to try one soon! These are gorgeous - must have taken ages! I hope you have time to join in, but will understand fully if you don't! So nice work!! Lovely! J.
Hello there. Congrats, your work is really nice. I would like you to know that I inspire a lot of things on your tips. I'm from Brazil and have my own blog (panosdabibi.blogspot.com) and facebook page (www.facebook.com/panosdabibi). Please, take a look and tell me what you think. Bye. Gabriela (gabriela_zbm@hotmail.com). I made my first foundation block!!! And the one I won as giveaway from Sonja Artisania on your blog last year. We LOVE paper piecing. My friend Jane is always telling us, "Pin & Preview" but we are more the "flip (the fabric) & curse" kinda gals so we understand how you feel when that piece doesn't quite fit. LOL.